The pretty 3-star Cyprotel Sidari Village is a charming family friendly hotel set in picturesque gardens and overlooking the glistening Ionian Sea. It is located on a hillside in the midst of cypresses and olive trees and overlooking the beautiful sandy beach of Sidari. 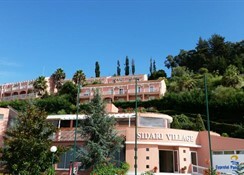 The Cyprotel Sidari Village offers wonderful views, attractive amenities and a friendly and attentive service to ensure you have the most enjoyable holiday possible on the fabulous island of Corfu. Individually designed guest rooms offer comfort in which to relax and unwind and each room has air-conditioning, satellite TV and an en suite bathroom to ensure a truly restful holiday in Sidari. 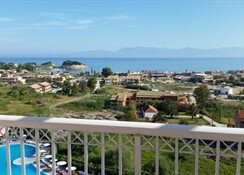 There are activities and facilities to suit all ages and interests so when you book the Cyprotel Sidari Village you can relax and have fun in the sun - great value for money too. Getting to the hotel: Just 35 km far from the islands airport. Food, drink and entertainment: Hotel restaurant offers plentiful buffets with a varied supply of local dishes and international fare; cocktails and daytime snacks are offered at the pool bar. Sport, games and activities: A sparkling lagoon style swimming pool is surrounded by a sun terrace; tennis and basketball courts; pool table and daytime animation. For the kids: Miniature playground, a splash pool; daytime animation activities for adults and children, Kids WORLD (3–11yrs). 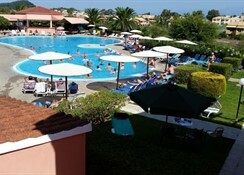 Additional: 24hr reception with money exchange, minibus around complex, mini–market, gardens, housekeeping. Hotel guest rooms (2-3 people) have twin or double bed plus an extra bed, air-conditioning‚ satellite TV, a fridge‚ a shower room‚ kettle‚ hair dryer and a balcony or terrace. Family duplex maisonettes (2-4 people) are open plan in style with twin beds on the ground floor and 2 extra beds on a platform up a set of stairs. Locally produced Alcohol; Locally produced non Alcohol, Soft drinks; Hot drinks; Cold drinks; Wine; Spirits; Juices; Liquers; Draught Beer; Vodka; Cocktails, Meal times. 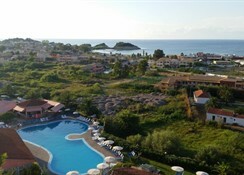 Corfu Panorama Resort is a 4* hotel located on the beautiful island of Corfu – Greece, 300m walk from the beach, 35 kms from the airport and 500m from the centre of Sidari village.